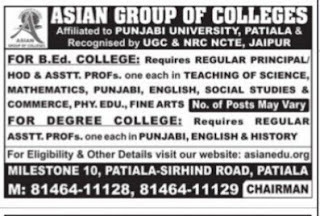 Asian Group of Colleges,Patiala,Punjab has advertised for the recruitment of Teaching Faculty- Principal,HOD,Assistant Professor jobs vacancies. Interested and eligible job aspirants are requested to forward resume immediately. Check out further more details below. 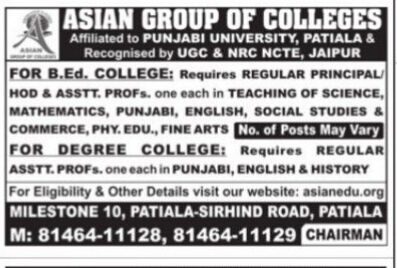 Name of the College: Asian Group of Colleges,Patiala,Punjab. About College:ASIAN EDUCATIONAL INSTITUTE- a College of Professional Education affiliated to Punjabi University, Patiala has been setup from the Session 2010-11 to impart quality education in the field of Science, Commerce, Arts, Education, Library & Information Science, management, Economics, Mathematics, statics, Computer Science & Bio-Science. How to Apply: Suitable candidates can visit website.